To ask other readers questions about Under This Same Sky, please sign up. UNDER THIS SAME SKY hooked me from the very first page. The story takes place in 1854 in Illinois and Becky and her Pa have just survived a tornado on their family farm. The tornado took her Ma and her sister, but for some reason spared Becky and her faith has been shaken. Becky's father has been seriously injured and has lost his sight. The traveling preacher comes and buries Becky's mom and sister. Matthew Brody is the preacher who goes from community to community to offer his services. He offers to take Becky's father to St. Louis so he can learn a trade. He needs to feel useful and be able to take care of Becky and himself. Matthew knows he should be moving on to the next town but feels the Lord is guiding him. He also notices how much Becky has grown and isn't the little girl he used to knew. Anyway, as Matthew and Becky's father are heading to St. Louis, they discover a stowaway! Yup, Becky has hidden in the wagon because she believes she is meant to be with her dad. Matthew doesn't have the heart to turn around and they all proceed to St. Louis. Becky and Matthew get to know each other along the way and when Matthew leaves them there, they decide to write each other while they are apart. Matthew gets a church in Becky's hometown and he is excited to maybe one day have her serve along side of him. UNDER THIS SAME SKY had my heart in my throat throughout most of the story and I couldn't wait to see what happened. UNDER THIS SAME SKY is filled with hope, love, tragedy, forgiveness, and finding your way back to God. Becky did a lot of growing up while in St. Louis and her faith is restored. Once I started reading, it was very hard for me to put this heart tugging story down. Becky struggles with her grief as well as her faith, and it was wonderful to watch her grow. The life lessons that author Cynthia Roemer weaves into her story are amazing and I am excited to read more by her. Becky's world is overturned following a deadly tornado. She understandably is bitter initially but her caring and loving personality come through ultimately. I especially loved the impact she had on Roy, Jimmie and Emily. The love of Christ and being dependent on His direction come through clearly in this novel. Under This Same Sky is a well done debut. I look forward to the next in the series. Under This Same Sky by Cynthia Roemer is a reminder of why ‘prairie fiction’ still resonates with us. It strips down the ‘essentials’ of life to the bare minimum and shines a light on what matters most: faith, family, and friendship. A little romance doesn’t hurt either. The story grabs your emotions from the very first page – Becky Hollister desperately trying to find help after a surprise tornado claims her mother and sister, leaving their family home destroyed and her father critically injured Under This Same Sky by Cynthia Roemer is a reminder of why ‘prairie fiction’ still resonates with us. It strips down the ‘essentials’ of life to the bare minimum and shines a light on what matters most: faith, family, and friendship. A little romance doesn’t hurt either. The story grabs your emotions from the very first page – Becky Hollister desperately trying to find help after a surprise tornado claims her mother and sister, leaving their family home destroyed and her father critically injured. I held my breath along with Becky as we waited for word on her father’s condition, occasionally distracted (I’ll admit it) by Pastor Matthew Brody who saves the day & then continues to drop in. While your life may not have been upended in quite the same way, I’m willing to bet at some point it has changed as fast as Becky’s did. We all can relate to her struggle to hold onto her faith in God’s goodness when life is hard, to cling to her dreams even as she learns to trust God’s dreams for her life. I think Roemer presented these issues authentically and with grace – grace not only for Becky as she works through them but grace for all of us who have been there too. Bottom Line: Under This Same Sky by Cynthia Roemer is as sweet as it is emotional. The blind school elements of the story are inspiring – with layered characters and touching wisdom. While I (of course) loved the budding romance between Becky and Matthew, I would have enjoyed the story just as much without it … because of the characters (except for Sarah, who I wanted to purse whomp lol), the setting and the message. If you’re a fan of Janette Oke, Kim Vogel Sawyer, Laura Ingalls Wilder and other stories set in the newly-settled heartland, you’ll really enjoy this book too! I'm honored to have the opportunity to share Under This Same Sky with you, Book One in my Prairie Sky Series. Set in 1854 on the Illinois prairie, it's the story of Becky Hollister, a young girl whose faith is shaken when tragedy strikes her family, altering her life forever. An unexpected chain of events and encounters help to, not only restore her faith, but open her heart to love and to God's perfect plan for her life. I hope you'll enjoy reading Becky's story as much as I enjoyed writing it. This is one of those books that starts off with a woman's struggle when she asks, "Why didn't You help them, Lord?" And I knew right away that this book was going to hit me hard. I had read the blurb so I knew that Becky Hollister would meet with tragedy and lose loved ones. I knew the setting was in the mid 1800's, so I knew that life would be a struggle for her, and it was. As so often happens when disaster strikes, people of faith still (often) can't help asking/wondering WHY God didn't preve This is one of those books that starts off with a woman's struggle when she asks, "Why didn't You help them, Lord?" And I knew right away that this book was going to hit me hard. I had read the blurb so I knew that Becky Hollister would meet with tragedy and lose loved ones. I knew the setting was in the mid 1800's, so I knew that life would be a struggle for her, and it was. As so often happens when disaster strikes, people of faith still (often) can't help asking/wondering WHY God didn't prevent it, or WHERE God was, especially if they've been faithful, attended church, been a "good" person, and so on. The struggle, however, was eased when she turned to God, just as it is for believers. Both Becky and her father lost (view spoiler)[Becky's mother and sister, and their faith in God was shattered (hide spoiler)], and her father had injuries from the natural disaster that occurred and took the lives of their loved ones. They have a wonderful pastor who guides them and helps them through their grief. His name is Matthew Brody. Becky and Matthew do have feelings for each other, but when Becky and her father move to another state, eventually his feelings wane and this leaves her with even more doubt. She had to come to terms with a lot, including her faith in God. I loved this book and thought it was very encouraging and inspiring. It included a lot of Bible verses, so for that reason I think that people who are not Christian might not enjoy the book as much. It is a bit "heavy" on the spiritual aspects of Becky's journey to emotional and spiritual well-being again. This book definitely deserves deserves a five star rating. I say this because the author has written her heart out in this beautiful book. Isn't it weird how we can take things the wrong way? A simple misunderstanding the wrong way? I know I have done that and probably will continue to do so. Especially if people don't make themselves clear the first time. I laughed at particular scene because it reminded me so much of Little House after Laura turned 18. I love how the author This book definitely deserves deserves a five star rating. I love how the author weaves in love, hope, and most of all trust in this book. It's hard to trust people once they've burned you but that's what trusting in the Lord and forgive others is all about don't you think? Even tragedy has a way of shaking out Faith to the very core. But, if you think about it, that is Satan at work. Once an angel in Heaven He knows how we work just as much as God does. Sorry this is a lengthy review. I just wanted to do this book justice because it was such a good book!!! I received this book for free. In no way required to review this book. Most of us have had to deal with loss, loss from a natural disaster is all over in the news these days. This story takes you through a horrible tornado that leveled one family's homestead. It also took a wife/mother and daughter/sister. The two left; father and daughter, are having to face life without their loved ones. The father sustained a head injury during the tornado and was rushed into town to the doctor. This story is so appropriate given the most recent suffering from weather and man made loss. I love the way the author shows you the inner struggle going on with those who lost their family. She is able to give hope with her truth of God's love and peace. There are other trials that this family has to struggle through and it really is sweet to see how each grew throughout the span of this story. This is a new author for me, I was given this book to read and review. I'm so glad I was. This is a wonderful story! I'll be reading the rest of her books for sure! First of all, I love the cover of this book. You can see that Becky is dressed in the clothing that her Aunt Ellen made for her. Becky is tenderly holding the Bible that Matthew has given her. Wow, I don't know how I would handled the aftermath of losing loved ones from a tornado! How devastating that was for Becky. And, not knowing if her Father would survive his injuries, very hard indeed. With the help of Matthew, Jimmy and Aunt Ellen, Becky learned to trust God to help her. I liked the fact t First of all, I love the cover of this book. You can see that Becky is dressed in the clothing that her Aunt Ellen made for her. Becky is tenderly holding the Bible that Matthew has given her. With the help of Matthew, Jimmy and Aunt Ellen, Becky learned to trust God to help her. I liked the fact that the author included Scripture and stories of heroes from the Bible in this book. There were so many lovable characters in this book. I highly recommend it. A tornado took the life of her ma and sister. Can Becky get help for Pa in time? Without giving too much away and being a spoiler, I 'll tell briefly that Becky and pastor, Matthew, each feel a romantic attraction for the other without the other knowing. Becky goes to St Louis for almost a year. During this time, Matthew's former girlfriend moves to their small community and tries to win back Matthew. Could this be the Lord's working, since he will need a wife. It was interesting to watch Becky mature and developed as a Christian. I enjoyed the history of the blind school as well as some of the differences between country life and city life. Sweet romance with a great message! A very sweet historical inspirational romance. I liked how the challenges of blindness in those days was explored and how the main character had to let go of her own desires and submit to God. The first Christian fiction books I remember reading growing up was Janette Oke’s Love Comes Softly series. This debut novel, Under This Same Sky, took me back to the prairie and the sweetness of first love in a similar fashion. Becky’s bravery and kindness made me like her from the start. Her coming-of-age story really has it all – family, friendship, love. My heart broke to see her doubt God during her pain and loss, but she matures in her faith and grows in character very nicely through the st The first Christian fiction books I remember reading growing up was Janette Oke’s Love Comes Softly series. This debut novel, Under This Same Sky, took me back to the prairie and the sweetness of first love in a similar fashion. I was disappointed the two of them weren’t able to spend more time together in the story, but their time spent apart was important to the plot. The friends Becky makes along the way are equally endearing. I thought the historical details were very well researched. I felt like I was traveling across the prairie and seeing the 1850’s version of St. Louis with my own eyes. I loved learning about the different cultures and how the school operated too. Under This Same Sky offers a beautiful message of God’s grace and healing beyond the hurt. The first page may open with tragedy, but the last page ends with hope. I finished Cynthia Roemer’s Under this Same Sky over the weekend. If you are looking for a sweet romance that also keeps you asking questions, you’ve found the right book. Becky Hollister’s life is turned upside-down when a tornado destroys her family’s farm, killing her mother and sister and injuring her father. Pastor Matthew Brody makes the rounds to check on his congregation and discovers Becky and her pa in need of serious assistance. He helps Becky rush her father to the doctor’s home. Her I finished Cynthia Roemer’s Under this Same Sky over the weekend. If you are looking for a sweet romance that also keeps you asking questions, you’ve found the right book. Becky Hollister’s life is turned upside-down when a tornado destroys her family’s farm, killing her mother and sister and injuring her father. Her pa’s injuries lead to his blindness and he makes the decision to attend a school for the blind far away from their prairie home–without Becky. Becky is heartbroken and wants nothing more than to be with her only remaining immediate family. She hatches a plan to stowaway in the wagon Pastor Brody will drive Pa to St. Louis in. On the way–after Pastor Brody and her father discover her presence and decide to allow her to stay–Becky’s admiration for Matthew begins to develop into affection. But the next year will be spent hundreds of miles apart. Can their budding love survive the distance? And the rearrival of Matthew’s old sweetheart back home? Can Becky find the faith she needs to accept her family’s tragedy? Becky Hollister’s life changes in an instant after a tornado hits her prairie home. She is forced to leave behind the only home she has ever known in hopes of helping her father heal from his injuries. Traveling pastor Matthew Brody helps with the move. Becky begins to believe there could be more than friendship between her and Matthew, but she begins to question things when she hears news of his imminent betrothal. Is it possible that God has different plans for her than she envisioned for hers Becky Hollister’s life changes in an instant after a tornado hits her prairie home. She is forced to leave behind the only home she has ever known in hopes of helping her father heal from his injuries. Traveling pastor Matthew Brody helps with the move. Becky begins to believe there could be more than friendship between her and Matthew, but she begins to question things when she hears news of his imminent betrothal. Is it possible that God has different plans for her than she envisioned for herself? This is a promising debut from Roemer. Her book is filled with love, tragedy, and forgiveness, but the overall theme is one of hope. There are numerous touching scenes with these realistic characters. Becky’s struggled to regain her faith and rebuild a relationship with God is one that will likely be familiar to many readers, particularly those who have gone through struggles in life. Strong supporting characters add to the enjoyment of this well-written historical work. Fans of Jeanette Oke are likely to enjoy this story. Bible verses are appropriately woven throughout. I look forward to reading the second book, which will be released in 2018. Disclaimer: I received a complimentary copy of this book, but I was not required to write a positive review. Thank you to the author, for giving me the PDF to read. The following review is my honest opinion and thoughts. Under This Same Sky is a beautiful story of learning to trust the Lord through hardships and follow His will for us. I liked how the author had several layers of things each character went through and experienced. A good read for anyone looking for an uplifting but not overly cheesy story of figuring out life and learning to trust Him. Rated three stars as the characters weren’t as devel Thank you to the author, for giving me the PDF to read. The following review is my honest opinion and thoughts. Cynthia Roemer’s debut, Under the Same Sky, is a story of healing and hope in the aftermath of a devastating storm that wreaks havoc on the heroine’s home and family. In Becky we see a young woman struggling through grief to find her way in a world turned upside down who learns to trust the Lord to guide her path in whatever circumstance. 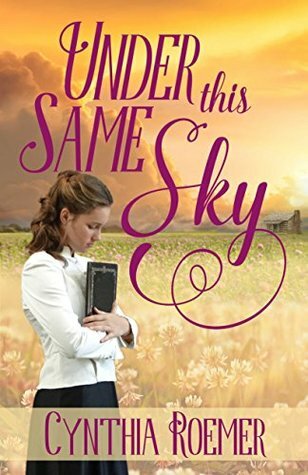 A lovely story with a gentle romance, Under the Same Sky will appeal to readers of Janette Oke and Kim Vogel Sawyer. I love this story and the author's voice. Wow! I often labor to get into books, but this one was captivating from the start and stayed that way. Pick up Under This Same Sky and let Cynthia Roemer take you back in time. Lovely. Under the Same Sky was one of my favorite books of 2017. It is a moving story about Becky Hollister. Becky and her father lose their home and Becky's mother and sister when a tornado rips through the prairie. Becky's father is injured and loses his sight as a result of the injury. Matthew Brody is the circuit riding preacher that services their community. When he finds Becky and the devastating situation her and her father are in, he dives in to help. He lays her mother and sister to rest and he Under the Same Sky was one of my favorite books of 2017. It is a moving story about Becky Hollister. Becky and her father lose their home and Becky's mother and sister when a tornado rips through the prairie. Becky's father is injured and loses his sight as a result of the injury. Matthew Brody is the circuit riding preacher that services their community. When he finds Becky and the devastating situation her and her father are in, he dives in to help. He lays her mother and sister to rest and he works to help gather the community to rebuild their home. As he is doing this, he gets a fresh look at Becky. She is not the young girl he remembers, but a beautiful woman that he feels drawn to. Becky begins to live temporarily with her aunt and uncle. Becky's father learns of a school for the blind in St. Louis that can help him learn a trade so that he can take care of himself and Becky. He decides to go for a year and leave Becky to live with her aunt and uncle. Headstrong Becky has other plans and stows herself in the back of the covered wagon. When Matthew and her father discover Becky, they do not have the heart to turn around. On the trip to St. Louis Becky and Matthew begin to develop feelings for one another. Matthew begins to wonder if Becky could become the preacher's wife he has been searching for. Becky and Matthew begin to correspond with one another through letters. Becky's relationship with God has suffered due to all that she has lost. When Matthew gives her his Bible, she begins to renew her relationship with God. As Becky and her father remain in St. Louis Becky transforms. At first her goal was to return to her home on the prairie and she could not imagine being happy anywhere else. But her goals and her plans change as she begins to work in the blind school that her father attends. She makes friends and begins to see God's hand working. Matthew is excited to be offered a church in the community that Becky is to return to. He is hoping she can minister to the community right along side her. Becky and Matthew's relationship goes through much testing in the book but despite that, God is working on both of them. As Becky realizes that God may be asking her to sacrifice the one goal and dream that she has, can she do it and still be fulfilled. Will God provide an alternative in time? Fans of Janette Oke are sure to enjoy this story from Cynthia Roemer. Every day, down-to-earth characters and a story that is full of emotion made this book a quick and easy read. I liked this story of life on the prairie and one young woman's struggle to keep her family together after tragedy strikes in the form of a tornado. Becky is smart, strong, and tough. She doesn't back down and gives up when times are bad. I liked these qualities and they made her a character I wanted to read more about Fans of Janette Oke are sure to enjoy this story from Cynthia Roemer. Every day, down-to-earth characters and a story that is full of emotion made this book a quick and easy read. I liked this story of life on the prairie and one young woman's struggle to keep her family together after tragedy strikes in the form of a tornado. Becky is smart, strong, and tough. She doesn't back down and gives up when times are bad. I liked these qualities and they made her a character I wanted to read more about. The way her father had to adapt to life after the tornado was well written and made it easy to understand what he was going through. I also liked Pastor Brody and thought he was a great example of a preacher during these times. Sarah was not a favorite character of mine but she made the story interesting. She's that character you love to hate. I liked the simple way in which this story was written. The author's writing matched the characters and the story they were a part of. This made the story more genuine and authentic and I really appreciated this as a reader. In fact, the author's writing made me think of Janette Oke and the Love Comes Softly series. Their writing styles are similar and both have written books that could be considered "comfort reads". This book was entertaining, easy to read, and had a spiritual theme that was woven into the story but wasn't over the top or too much. I found myself reading this book quickly yet slowing down a bit at the end because I didn't want the story to end. I liked these characters and the time I got to spend with them. This book does not read like a debut novel but one from a seasoned author. I can't wait to read the rest of this series. Cynthia Roemer is now on my "must read" list and I highly recommend her to fans of historical fiction (or anyone looking for a really enjoyable read). This was my introduction to Ms. Cynthia Roemer's writing. The setting of the prairie in the west during 1850s was definitely interesting. There were so many hardships, natural disasters, and heartbreak the people settling the prairie went through. Ms. Roemer's writing is easy to follow and the book reads quickly. There isn't a lot of action and the events in the storyline move somewhat slowly, but I'm assuming that was what life was like on the prairie. Her main characters, Becky and Matthew, ar This was my introduction to Ms. Cynthia Roemer's writing. The setting of the prairie in the west during 1850s was definitely interesting. There were so many hardships, natural disasters, and heartbreak the people settling the prairie went through. Ms. Roemer's writing is easy to follow and the book reads quickly. There isn't a lot of action and the events in the storyline move somewhat slowly, but I'm assuming that was what life was like on the prairie. Her main characters, Becky and Matthew, are interesting and grow quite a bit spiritually and emotionally during the book. Becky has just lost her mother and younger sister to a storm and her father is struggling to heal from injuries. His healing process takes them far away from their prairie home and Becky needs to learn how to let go of her childish, self-centered ways to serve and love others. Though well-characterized, I couldn't fully connect with Becky as a person. Maybe it was her pouty seventeen-year-old ways of dealing with life or her complaints. She does mature greatly towards the end of the book though. Matthew is a circuit preacher who ends up helping Becky and her dad out a lot in the healing process. I did like his faith, gentleness, and compassion until 2/3 way into the book when he became all confused, spineless, and wishy-washy. I did not expect this out of Matthew and was quite disappointed. Both Becky and Matthew make huge leaps in their faith during the story; they learn to trust God more deeply and understand that He is in full control. I really appreciated the spiritual truths liberally sprinkled into the storyline. Those who enjoy historical fiction set in the west during the 1850s would enjoy this book. Though not my favorite time period nor my favorite setting, the book was interesting and enjoyable. This is honestly one of the best books that I've read this year! From the very first page, as Becky frantically went in search of help for her injured father, I was hooked. Becky is young, frightened and unsure what the future holds for her as she grapples with the loss of her mother and sister and the family farm after the tornado. Mercifully, her father's life was spared, but the injuries he sustained brings new worries and life changes. It also brings a move to St. Louis which takes them away This is honestly one of the best books that I've read this year! From the very first page, as Becky frantically went in search of help for her injured father, I was hooked. Becky is young, frightened and unsure what the future holds for her as she grapples with the loss of her mother and sister and the family farm after the tornado. Mercifully, her father's life was spared, but the injuries he sustained brings new worries and life changes. It also brings a move to St. Louis which takes them away from the prairie that she loves and the only home she's ever known. The move takes her away from Matthew Brody, the preacher whose help has been invaluable to her and her father. Ms. Roemer keeps her characters down to earth and true to their beliefs throughout the story, which I found refreshing and realistic. The move to the city didn't change them or make them want a different lifestyle than the one they had back home. They faced uncertainty, they worked hard, they brought happiness to others and they did it all with dignity and grace. Under this Same Sky was a sweet romance that will forever stand out to me for it strong, real-life spiritual thread. Cynthia has done a masterful job in taking us through the faith struggle of Becky Hollister as she deals with the tragic loss of her Mother, Sister, and her Pa’s vision. God has not promised a life without struggles, but He has promised to be with us as we face them. This story is so real to the emotions and struggles we face as Christians dealing with a tragedy that it strengthens Under this Same Sky was a sweet romance that will forever stand out to me for it strong, real-life spiritual thread. Cynthia has done a masterful job in taking us through the faith struggle of Becky Hollister as she deals with the tragic loss of her Mother, Sister, and her Pa’s vision. God has not promised a life without struggles, but He has promised to be with us as we face them. This story is so real to the emotions and struggles we face as Christians dealing with a tragedy that it strengthens your own faith. Becky is a heroine who matures from a youth into a woman with a deep love for others. Pastor Matthew Brody is a hero whose strong faith but real struggles make you want to kiss him. His strength and compassion will melt your heart. The supporting cast of characters, especially those of the Blind School, swell your heart. I loved Jimmy, Roy, and Emily. With the help of the hero, Jimmy, and Aunt Ellen, Becky’s faith strengthens in a way that is so relatable and heart wrenching that you can’t help but be carried through the pages. Under This Same Sky, by Cynthia Roemer, spoke to me for many reasons. First of all, the time period is one of my favorites. Cynthia’s descriptions of the prairie through heroine Becky’s eyes make this sometimes desolate and lonely land truly beautiful. The author chose blindness as her character’s condition, which fascinated me on a personal level since my mom, born legally blind, received her high school education at an institute for the education of the blind. Even though the time period and l Under This Same Sky, by Cynthia Roemer, spoke to me for many reasons. First of all, the time period is one of my favorites. Cynthia’s descriptions of the prairie through heroine Becky’s eyes make this sometimes desolate and lonely land truly beautiful. The author chose blindness as her character’s condition, which fascinated me on a personal level since my mom, born legally blind, received her high school education at an institute for the education of the blind. Even though the time period and location were different, I enjoyed the facts about the education of blind people that Cynthia wove into her story. In this debut novel, the author weaves the faith journeys of her main characters throughout the story, using a well-known Bible story as one of her techniques to share the message of obedience in a non-preachy manner. Characters are multi-dimensional and their interactions and the circumstances they are confronted with are realistic. Cynthia has crafted an inspirational story with creative challenges for her characters. I look forward to more work by this author.